Give the Giving Tree a Go! I’m delighted that on Thursday 10th November, I’ll be in Blackwell’s bookshop in Edinburgh to help launch this year’s Children’s Giving Tree appeal. This is a brilliant scheme which allows customers to gift a book to a child who is living in difficult circumstances over Christmas. 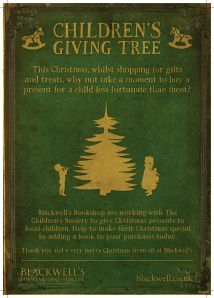 Each child can request a special book, or a book about a particular subject, and the requests are written on Christmas tags and displayed on the ‘Giving Tree’ in the Children’s department of the shop. You can choose one of these tags and buy the book, safe in the knowledge that it will go to a disadvantaged child who really, really wants it – and you don’t even have to go into the shop; you can gift a book on line. The Giving Tree gets bigger and bigger every year, but of course, it only works if you people get involved! Go on – it’ll make you feel pretty good too.